This second exercise is to introduce the Kids to the basis of proper sliding on the forehand. In this exercise the two-handed sliding deflection is taught. Starting at the red double cone, the players run in a curve towards the goal. 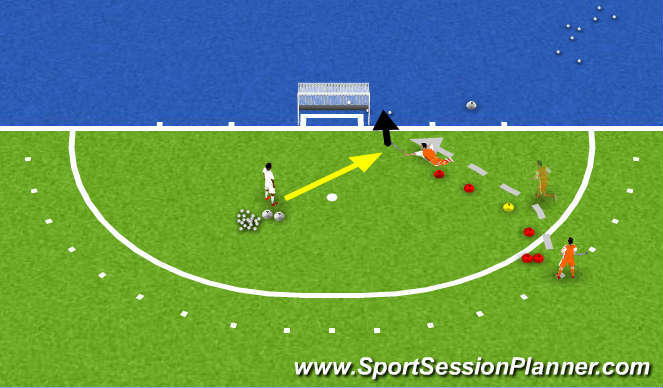 When the player passes the yellow cone the trainer rolls a ball towards the white cone behind the baseline (which serves as orientation point). The player dives and deflects this ball while sliding on his belly (so not chest!). After this, the next player starts. 2. The last step is with the right foot. This step should be big, which will lower your center of gravity and make sliding less painful and safer. 3. During the last step, twist your body and your foot so your toes point a bit to the left. This twist will put you off-balance and will make you fall easier. 4. Slide on your right forearm with your elbow on the ground. 5. Eyes on the ball at all times. 6. Keep stick still in two hands. - When the Kids roll over and end up on their back, there is a problem with their balance. Allow them then to slide with the stick in one hand (left hand) and keep their right hand on the ground for balance. - When their timing s off, change the position of the yellow cone. Â± Adjust the speed of the rolled ball to increase or decrease the difficulty of this exercise. However, always roll towards the white cone which serves as orientation point.